Travelling to USA – How to get a health insurance plan. Are you planning a short visit to the USA? Maybe, you want to join your son or daughter living there with their kids, you may have been invited by your close relative or friend for a pleasure trip or your parents are visiting you after a long time. Whatever be the case, it’s a period of excitement and rewarding experience. But in that excitement and joyous mood, you may overlook one important thing – making a provision to meet unexpected medical conditions during the visit . Health insurance covering your visit period – Why is it so important? Deductible and Co-insurance – How it affects your insurance coverage? 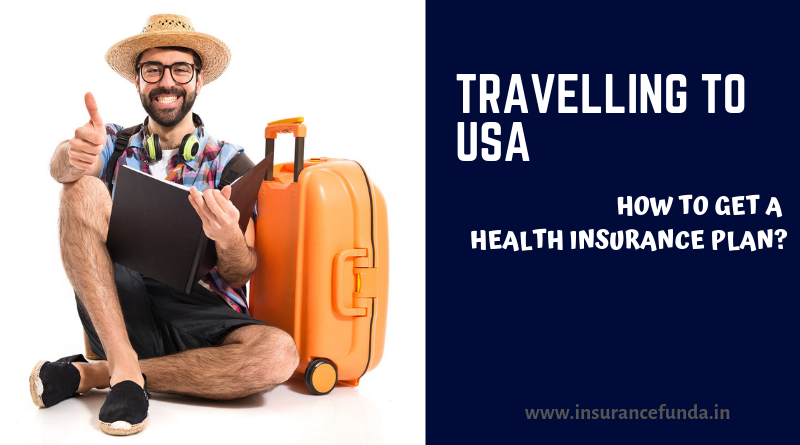 How to purchase a travel-health insurance plan for the USA visit? Unexpected health emergencies can spoil the trip and bring in a lot of frustration and stress to you. Apart from that, it can drill a huge hole in your pocket, as the medical expenses are unbelievably high in the USA. Typically even a 5 day stay in a hospital can cost you anything around $10000. As you cannot avoid such difficult situations, the next best thing to do is to take the necessary precautions to relieve stress and financial burden. You can purchase adequate health coverage for the visitors, well in advance. Let us have a look at the possible options. How it works Have specific benefit limits for different covered medical expenses. Do not have any benefit limits based on the type of medical expense. But there can be a cap on the total benefits payable. Trip expenses Not covered Covers trip cancellation, Baggage loss, Baggage delay etc. also. There are some important terms which you will come across while taking an insurance at USA. Deductible is the amount that consumer pays for the incurred expense before the insurer pays. If your plan has a $100 deductible, you pay the first $100 expense and the insurance company picks up the rest. Higher the deductible lower your premium will be. * just an example to show how it works. actual plans can vary. Minimum and maximum period varies from plan to plan.In most cases the minimum period allowed is 5 days and maximum period is 12 months. Short term visitor medical insurance plans are designed to protect against sudden accidents or illnesses and usually do not include benefits for preventive care, immunizations, dental or vision care. These Short term plans also do not cover pre-existing medical ailments. But there are some plans which cover such pre-existing conditions also. If you specifically require such plans you can go for them. Each insurance product could be linked to certain network of hospitals and service providers. You get easier services like cash less facility and discounts if the insured is treated in one of the hospitals linked to the preferred provider network. No need to add that it is more advisable to take the policy from a company which has a PPN of larger coverage, at least in your area. Reputation: Tokio Marine HCC’s major domestic insurance companies are rated “A++ (Superior)” from A.M. Best. Sample policy price: A 14-day policy for a 30-year-old traveling from the U.S. to France would start at about $17.55 for $50,000 in coverage, with no deductible. Reputation: A+ (A.M. Best) Sample policy price: A 14-day policy for a 30-year-old traveling from the U.S. to France would cost about $21.57 for $50,000 in coverage, with no deductible. Reputation: A (A.M. Best) Sample policy price: A 14-day policy for a 30-year-old traveling from the U.S. to France would start at $17.81 for $50,000 in coverage, with no deductible. Reputation: A+ (A.M. Best) Sample policy price: A 14-day policy for a 30-year-old traveling from the U.S. to France would start at about $36 for $50,000 in coverage, with no deductible. You can use the Preferred Provider Networks mentioned above to purchase the plans. Actual prices can be computed at the websites of PPNs by providing your journey details. You will have to provide age, destination, date of visit, total trip cost etc. there. Several coverage options such as Basic and prime could be there. Best suitable coverage option can be selected based on your needs. Conclusion: Travel medical insurance provides you peace of mind by covering overseas medical treatments, hospitalizations, and medical evacuations, as well as trip reimbursements if you have to go home early. Selecting the plans most suitable for you is not an easy job owing to the umpteen number of companies and plans available to choose from. But always remember to read the fine print to ensure you encounter no surprises when you try to make a claim. If you have some doubts or require any clarifications, feel free to drop a query in the comment section below. Read more: Top 5 Best General Health and Motor Insurance Companies – 2018.